"God draws straight with crooked lines. " Through our Vocations Support Program, the Knights of Columbus demonstrates its unwaivering support for the Priesthood at its earliest stage. Having taken the first step by entering seminary, our Order attempts to support these young men by offering financial, moral and spiritual assistance. Adhering to the intent of our Supreme Council, we 'adopt' our seminarians and accept the challenge to maintain our support through their years of study. God willing, we will be in attendance at their Mass of Ordination. Beginning July 1, 2009, under the direction of Grand Knight Dennis Griffin and with the guidance of Church Activities Director, William Waugh, our Council reactivated the Vocations Support Program. Within a few short months, we adopted Nicholas Fernandez, our first seminarian. As of September 2013, our ministry has expanded to seven seminarians! In June, 2011, our new partnership began supporting Mary Theresa Naccarato, a postulant of the Sisters of the Presentation. Mary's journey is ongoing and we look forward to her final profession of vows. However we judge our progress, we know none of it would have been possible without the generous support of our parish family and the kindness of people throughout our local communities and beyond. Please consider helping our ministry. 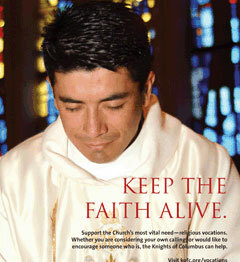 All donations are greatly appreciated and 100% of your gift goes directly to our vocations. Make your check payable to: Knights of Columbus, Council 5890, and write 'vocations support' in the memo section. PO Box 22, Washingtonville, NY. 10992. Thank you to all for your past assistance and consideration of future support.